Sony has announced a duo of new in-car stereo sat navs, which do away with Sony's own mapping system and utilise TomTom technology instead. 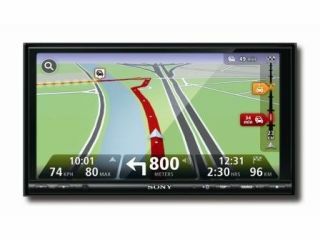 Sony has always been on the fringes of the sat nav market but its own software inside has meant that its navigation system has left a lot to be desired, so the integration of TomTom is definitely a good one for the company. Sony announced at IFA 2010 that it would be working with TomTom for the first time, with the XNV-L77BT and XNV-L66BT – part of the company's Xplod range. Each setup comprises Sony's AV head unit and TomTom's navigation module. Integrated into the two sat navs is the following technology: Local search with Google (pretty self explanatory), real-time travel updates with IQ Routes, up-to-date maps with MapShare and the use of TomTom Home software. The maps on offer are European. As for what Sony is bringing in the hardware stakes, the sat navs boast an 800x480 pixel WVGA screen (the L77BT is 7 inches, the L66BT 6.1-inches), fake 5.1 sound, USB port, Bluetooth and music connectivity. The XNV-L77BT and XNV-L66BT have a UK release date of October, with pricing to be announced.